Tehran: The death toll of a major earthquake that hit the Iran-Iraq border overnight rose to more than 400 on the Iranian side of the border on Monday, the coroner's office said. Thousands were injured in the 7.3-magnitude quake that hit late Sunday, state television reported the office as saying. A previous toll stood at 323 dead and 2,700 wounded. The Baghdad government did not immediately give word on casualties in that country, though Prime Minister Haider Al Abadi issued a directive for the country's civil defense teams and "related institutions" to respond to the natural disaster. 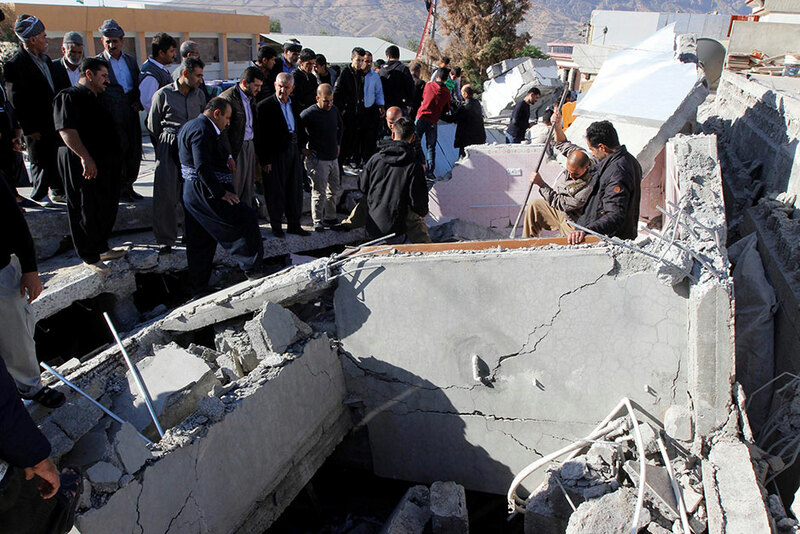 Hundreds were killed, Behnam Saeedi, the deputy head of the Iranian government's crisis unit set up to handle the response to the quake, told state television. Seven others were reported dead on the Iraq side of the border. The quake was so powerful that the tremors were felt in Lebanon and Turkey. The termors were also felt in the UAE, according to social media users. The tremor in the Iraq-Iran border region was of magnitude 7.2 and struck 103km southeast of the city of Sulaymaniyah, the US Geological Survey said. A map showing the powerful quake's epicentre. Images from the nearby town of Darbandikhan showed major walls and concrete structures had collapsed. It was felt in the UAE, according to social media users. Footage posted on Facebook by Gulf News reader Syed Kazim Raza showed residents on the streets in Al Qusais 2 after the tremors were felt. Social media users said the quake was felt in Iraq, Iran, Turkey, Syria, Kuwait, Jordan, Israel, UAE, Armenia, Azerbaijan and Georgia. The U.S. Geological Survey issued an "orange" alert for "shaking-related fatalities and economic losses." Iranians set up temporary camps outside of shaken buildings in Pole-Zahab, Kermanshah province — EPA. 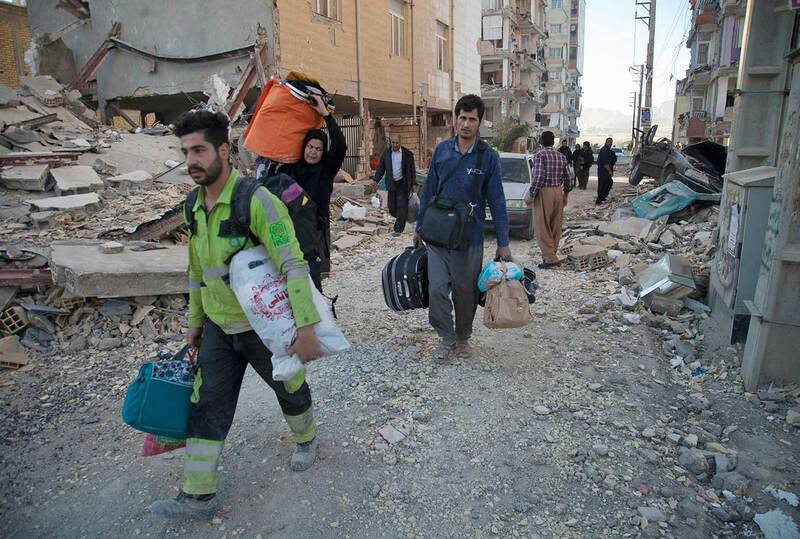 Iranian social media was abuzz with area people evacuating their homes. “I was sitting with my kids having dinner and suddenly the building was just dancing in the air,” said Majida Ameer, who ran out of her building in the capital’s Salihiya district with her three children. “I thought at first that it was a huge bomb. 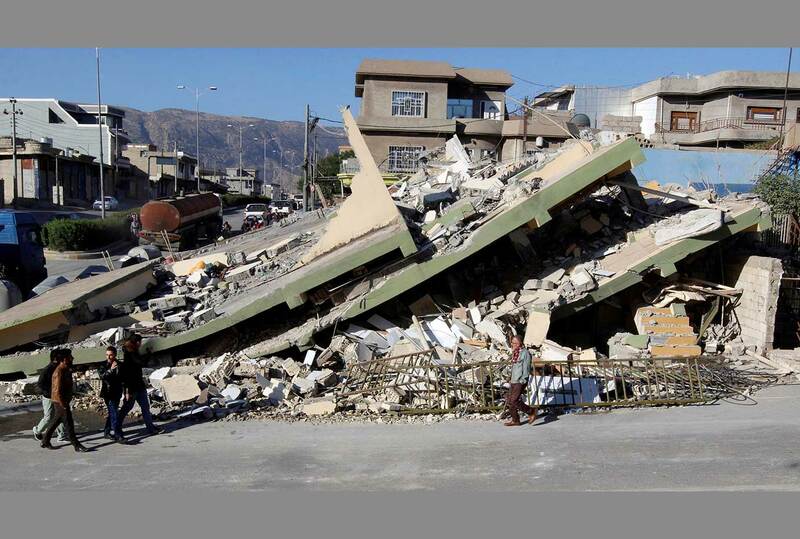 But then I heard everyone around me screaming ‘Earthquake!’” There were similar scenes in Erbil, the capital of the semi-autonomous Kurdistan Region, and across other cities in northern Iraq, close to the quake’s epicentre. The quake was even felt in the Iranian capital Tehran, with some villages hit by power cuts, Iranian state TV reported. Meanwhile, a 6.5 magnitude quake struck the Pacific coast of Costa Rica near the capital, San Jose, on Sunday night, while another tremor measuring 5.8 on the Richter scale hit off the coast of Japan late on Sunday, the US Geological Survey said. There was no Pacific-wide tsunami threat, the US National Weather Service said. A 6.5 magnitude quake struck the Pacific coast of Costa Rica near the capital, San Jose, on Sunday night. The quake in Costa Rica, initially measured as much as 6.8 magnitude, was centered 43 miles (69 km) southwest of San Jose at a depth of 12.3 miles (20 km), the USGS said. Meanwhile, a huge 5.8 magnitude earthquake has stuck of the east coast of the Japan, according to the US Geological Survey (USGS). A map showing the epicentre of the quake in the Pacific Ocean. The quake hit 218 miles (351 km) east of Sendai, Honshu, at a depth of 5.9 miles (9.5 km). The USGS initially recorded the quake as having a 6.1 magnitude but this was later downgraded to a 5.8. It is unclear yet if there was any damage to villages and towns on the east coast. It is understood the earthquake has not triggered a tsunami warning.